27-10-2010: The Crown Estate has announced that is has awarded an agreement for lease for the Inner Sound tidal project to MeyGen, a joint venture between Atlantis, International Power and Morgan Stanley. With a capacity of up to 400 MW, the project is one of the world’s largest planned commercial tidal stream energy developments. This concludes the re-tendering process we have been running since April and the end of the first round of leasing in the Pentland Firth and Orkney waters. With the addition of the Inner Sound, there are now 11 Pentland Firth and Orkney waters projects. The total potential capacity is 1.6 GW, up from the 1.2 GW announced in March. The Crown Estate will now increase the enabling actions fund, intended to accelerate and reduce risks in development, from its current level of £4.0m to £5.6m. With 1.6 GW of planned green energy deployment, the Pentland Firth is the undoubted jewel in the crown of our wave and tidal resources. We will continue to work with The Crown Estate to support low carbon developments, ensure communities can reap the benefits and secure Scotland’s position as the green energy capital of Europe. The Inner Sound is known as the crown jewel of the Pentland Firth and MeyGen has the potential to be a flagship marine energy project. The challenge now is to transform that potential into reality. We’re looking forward to working with the community, The Crown Estate and the Government, employing local people and business, for an entirely new industry. The Inner Sound lies within the Pentland Firth and Orkney waters strategic area, between Caithness on the Scottish mainland and the island of Stroma. It is one of the most energetic tidal areas in the Pentland Firth. 20-03-2010: The Crown Estate has announced the names of the successful bidders for the world’s first commercial wave and tidal leasing round, for ten sites in Scotland’s Pentland Firth and Orkney waters. The 1.2 GW of installed capacity proposed by the wave and tidal energy developers for 2020, 600 MW each from wave and tidal, is four times the peak output of Dounreay power station. This is enough electricity to meet the needs of up to three quarters of a million homes. The developers have signed agreements for lease with The Crown Estate to take forward the development of their wave and tidal energy installations. This will allow developers to enter the statutory consenting process for their sites with security of access to the seabed. As owners of the UK seabed out to the 12 nautical mile territorial limit and over 55 percent of the foreshore, we have been working closely with our partners, Scottish Government, Highlands & Islands Enterprise, Orkney Islands Council and the Highland Council, to maximise the benefits to the local area and the rest of Scotland from investments such as the offshore renewable energy programme. Wave: SSE Renewables Developments Ltd, 200 MW for Costa Head site – Aquamarine Power Ltd & SSE Renewables Developments Ltd, 200 MW for Brough Head site – Scottish Power Renewables UK Ltd, 50 MW for Marwick Head site – E.ON, 50 MW for West Orkney South site – E.ON, 50 MW for West Orkney Middle South site – Pelamis Wave Power Ltd, 50 MW for Armadale site. Tidal: SSE Renewables Developments (UK) Ltd, 200 MW for Westray South site – SSE Renewables Holdings (UK) Ltd & OpenHydro Site Development Ltd, 200 MW for Cantick Head site – Marine Current Turbines Ltd, 100 MW for Brough Ness site – Scottish Power Renewables UK Ltd, 100 MW for Ness of Duncansby site. Together with some 11 GW of planned offshore wind developments, these latest marine renewables projects show that Scotland is powering ahead in the development and deployment of clean, green energy. The Secretary of State for Scotland Jim Murphy said: “This is a welcome world-first for Scotland and I am happy to see the major steps being taken to harness Scotland’s wave and tidal energy. It is an extremely exciting time for renewables in Scotland and across the rest of the UK as we use more of our natural resources to generate our power. “Scotland is naturally placed to make the most of this green revolution and we will continue to work with others to ensure the potential of Scottish waters, alongside wind power, is fully met. Roger Bright, Chief Executive of The Crown Estate said: “I am delighted that today, in Wick and Kirkwall, we have announced the successful bidders for the world’s first commercial wave and tidal leasing round in the Pentland Firth and Orkney waters. The 1.2 GW of marine renewable generation capacity, 600 MW each from wave and tidal, is generating four times the electricity of Dounreay power station in its heyday. This shows the world that marine energy can produce significant electrical power and offer a real alternative to conventional power production. Atlantis Resources Corporation (“Atlantis”), one of the world’s leading developers of electricity-generating tidal current turbines, unveiled the largest and most powerful tidal power turbine ever built, the AK1000™, yesterday at Invergordon, Scotland. The AK1000™ is due for installation at a dedicated berth at the European Marine Energy Centre (“EMEC”), located in Orkney, Scotland later this summer. 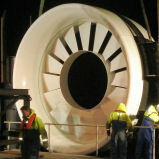 Dignitaries, utilities and technology partners from around the world attended the unveiling of the flagship turbine at the Isleburn Engineering facility, taking the only opportunity to view the turbine before it is installed on the seabed and connected to the grid at EMEC. Despatching 1MW of predictable power at a water velocity of 2.65m/s, the AK1000™ is capable of generating enough electricity for over 1000 homes. It is designed for harsh weather and rough, open ocean environments such as those found off the Scottish coast. The turbine incorporates cutting edge technology from suppliers across the globe, has an 18 meter rotor diameter, weighs 1300 tonnes and stands at a height of 22.5 meters. The giant turbine is expected to be environmentally benign due to a low rotation speed whilst in operation and will deliver predictable, sustainable power to the local Orkney grid. The AK1000™ nacelle was fabricated by Soil Marine Dynamics in Newcastle in England and the gravity base structure and system assembly was completed by Isleburn Engineering, a member of the Aberdeen based Global Energy Group. Steel for the turbine came from Corus’ Scunthorpe facility.